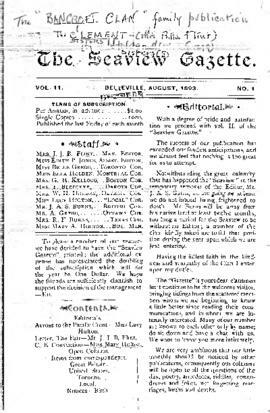 File contains a photocopied manuscript set of volumes 1 and 2 of The Seaview Gazette, a newsletter produced by members of the 'Bancroft Clan' in Belleville, Ontario, for the period June 1892 to April 1893. Also included are photocopied printed monthly issues of the publication August 1893 to June 1894. The issues largely focus on social news, visits and community events. Also present is a letter of 28 September 1966 from Wlliam F.E. Morley, Curator, Special Collections Queen's University, Kingston to Gerald Boyce accompanying the transmission of the copies.